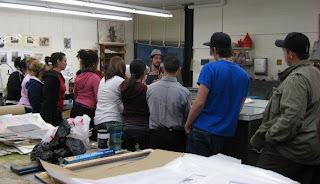 Drive By Press made a return visit to Kean University's Art Department this week. 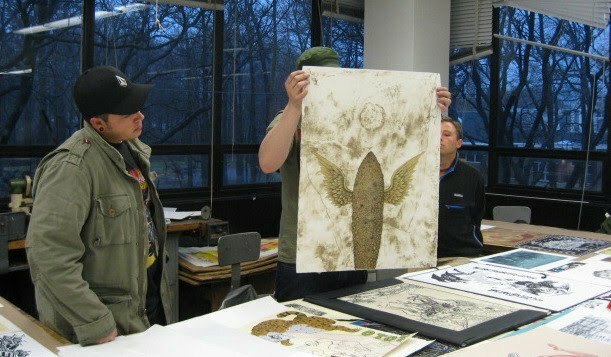 Tonight was the second day, and like last time, on this night there was a presentation on their history and about printmaking in general. 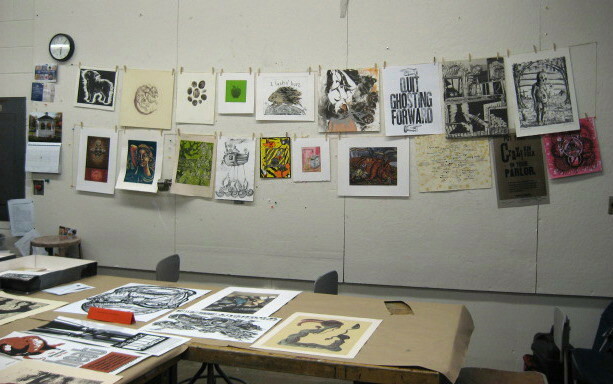 Co-founder Greg Nanney showed a small sampling of the thousands of prints in their collection, all donated by printmaker friends from around the country. 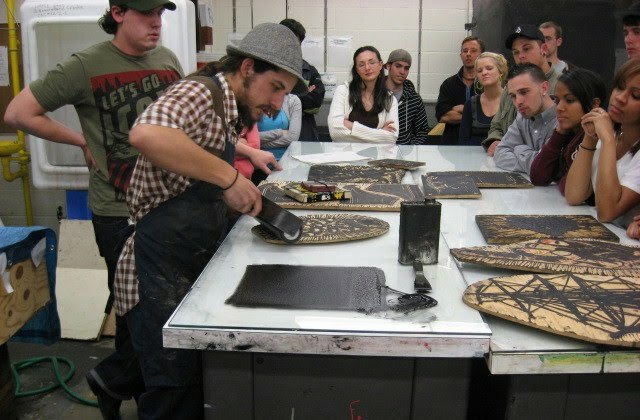 The other part of the lecture is a demonstration of block printing. 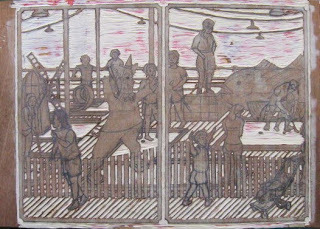 They brought in several blocks from the set they carry on their travels, and Steve (see below) showed how to ink a typical block with a large brayer. The guys will print any of their blocks on paper, but by far the most popular destination for the designs is on t-shirts. The shirt below shows the block being inked above. 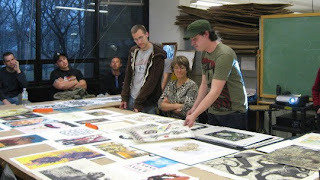 Students and faculty in attendance enjoyed the presentations, with many questions about the world of printmaking and the various processes employed to make the prints on display. 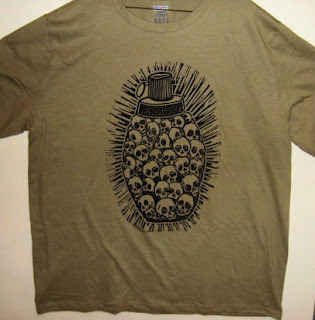 Quite a few departed with woodcuts printed on shirts or other items of clothing. And I think that some of the printmaking students were really excited to apply some of what they saw to their own work. All in all, a fun way to take our minds off the miserable weather of the past few days. Had time for a short Studio session this afternoon, so back to the golf block. Today's task was to finish all that remained of the golf holes, which was the platform in front of the bluefish (bottom photo) and to cut out all the wooden frames that surround each green. 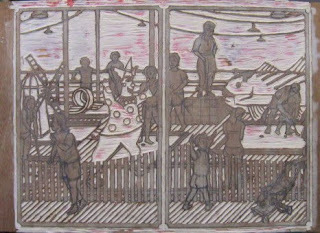 That leaves two major elements left to cut- the foreground fence and all the figures. After that a few incidentals that remain uncut for now as I haven't decided what I want to do with them yet. Today's session in the Studio went according to the plan. I dealt with the various obstacles of the golf course. 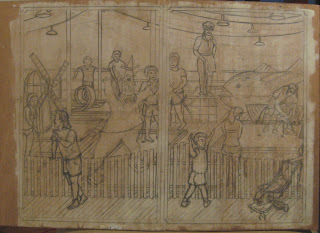 I worked my way from left to right, cutting the windmill, the loop, the clown, and finally the bluefish. I still need to finish the steps and platform in front of the fish, as well as the low frames (borders) around each hole. After that will likely be the fence, then finally the figures. My goal is to at least finish all the cutting by next Monday, so I can show the block at the April critique. Even better would be to have a proof to show, but the holiday and my work schedule may not let that happen. As planned, today's cutting was the greens that make up the miniature golf course. The parts seen through the fence may not have much identity now, but color will hold those shapes together when it's all done. 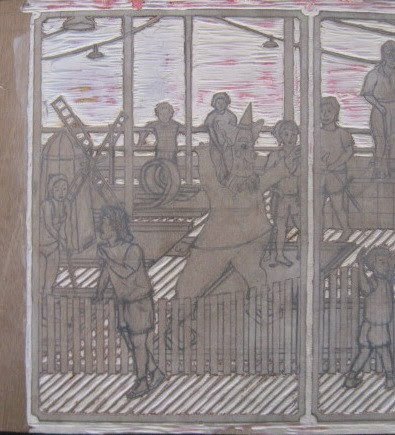 Had a little time left in my planned time in the Studio, so I took care of one more thing, cutting the strip of ocean seen through the rails of the back fence. Next time I will start cutting everything that remains of the golf holes- the obstacles, then the borders of each green. Art School Update- The 3rd round of the NCAA tournament saw the elimination of Syracuse and Northern Iowa, my last two art connected schools this year. One of the Final Four teams in my brackets made it through, so at least I have someone to root for next weekend. 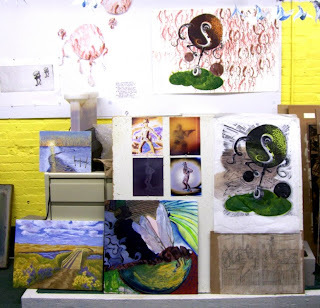 Had enough free time in the afternoon to put in a few hours in the Studio. Today's task was to cut the boardwalk boards on the whole left panel, or work for two hours, whatever came first. Met my goal and beyond, also cutting out a little horizontal strip representing a piece of the beach seen through the back fence. Next time I move on to the last large areas, the greens, and maybe some of the large obstacles. Put in several hours in the Studio today. The first hour was spent cutting out the sky on the right side. Pretty routine stuff. I took time out for lunch, and took a break from the block to work on some teaching related stuff. 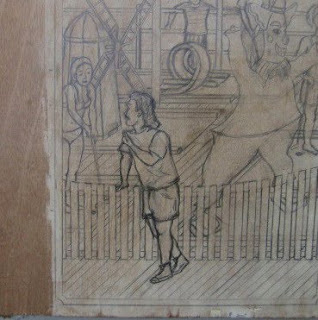 But then I picked up the tools and took on another big section of the block, the boards of the boardwalk. This time I started on the right side. This was more exacting work, very tedious, but I might as well get it out of the way now. I took some time first to redraw all the boards, making sure they were evenly spaced and they lined up from foreground into the background. Two hours later I was finished with cutting all the boards in the right panel. Below is the current appearance of the whole block. In other news, we are now through the first weekend of the NCAA tournament and I have two of my art connected schools still alive. If asked a week ago to pick which two they would be, I'd have probably guessed Syracuse and Villanova, a #1 and #2 seed respectively. Syracuse did survive, but one of the biggest surprises of the tournament is that #9 seed Northern Iowa beat overall #1 Kansas to reach the sweet 16. This messed up a whole lot of brackets (including mine) but it's nice to have another Missouri Valley Conference team (like my beloved Salukis) make it to the 2nd weekend. 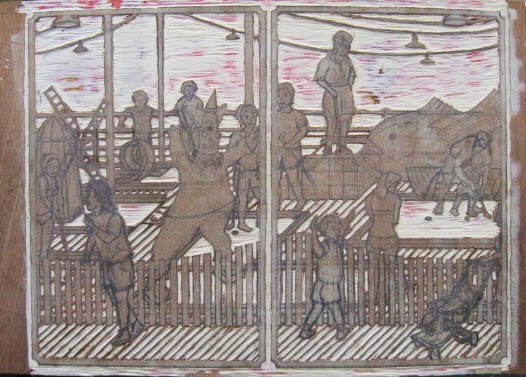 I have two links to UNI- two prints from the Ecclesiastes series were part of the juried group show A Question of Faith in 2001, and one of those prints was used on the cover of Religion & Education, an academic journal produced at the university, in 2002. Time to start the real cutting on this block. But before that a few minor changes, all involving the overhead light fixtures. With those settled I started on the sky. Mostly a big empty area- not too exciting but it needs to get done sometime. Finished all the sky in the left side panel, from the top border down to the horizon (ocean). Tomorrow or the day after I'll cut the sky on the other side, then start dealing with the considerably more complex cutting that makes up the rest of the block. Today is the feast of St Joseph, patron saint of Italy, and a day always celebrated at Studio Arrabbiata. 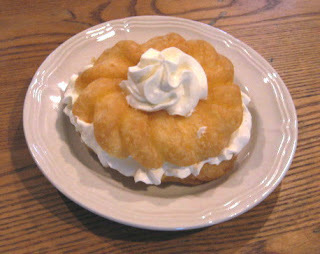 I celebrated the end of my workday with some nice pizza, a cold beer, and picking up one of these, the traditional dessert. In honor of the day, I'm going to give myself the rest of the night off. A month ago I went to one of the biweekly figure drawing sessions in Belmar and spent two hours doing one bad drawing after another. No good reason why- the model is a good one I've worked with many times before. Sometimes you just don't have it. That same model was back tonight, but this time things were much better. 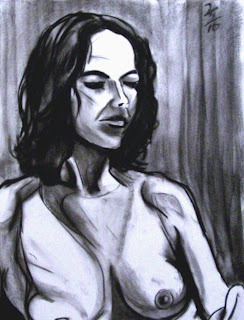 Whether it was a 5 minute pencil sketch (as seen above) or a 40 minute charcoal drawing (see below), I had a much better feel for the subject tonight. 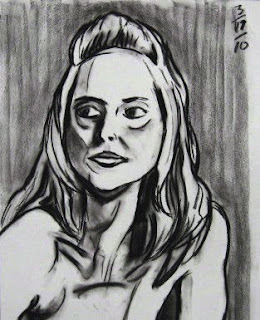 Not that either drawing looks exactly like her (the model suggested that the charcoal could be her imaginary sister), but they look far more human than the drawings of her I did in February. This model also happens to be the one who I had in the Studio back in December to pose for some Floating World characters, including a few bikini-clad golfers. Since that block sketch is essentially done, I brought it with me tonight to show her during one of her breaks, so she could see how her efforts fit into the project. She was suitably impressed and looks forward to seeing the final full color version. Into the Studio for a few hours today. Made some minor adjustments to some of the figures in my golf scene. I still may want to make a few other small changes, but I can deal with those as the cutting process moves forward. 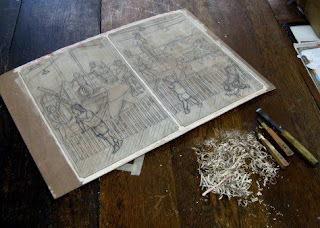 Meanwhile I took care of the necessary first step, cutting out the external border of both panels of the diptych. Another day of this and that. 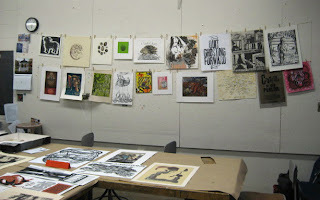 Today's visit to the Studio was to prepare for my students' woodcut projects later this week. 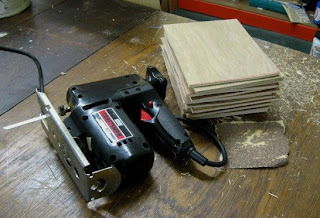 As expected, I'm going to keep the nice smooth flat board I bought recently for myself, and I made blocks for my students using some other stored wood. I have some large pieces that have some significant warping, too much for me to use for any planned projects. But cut to small size the pieces are pretty flat. Cut, sanded, done. Finished my block sketching in time for today's NCAA selection show. Once again I take time to note how many of this year's participating schools are also places where my art has been exhibited. I had thought this might be the year that William and Mary would make that list, and early in the season they were on the edge of being ranked and being talked about as a possible at large bid. But a few bad runs during their conference season and losing the conference title game means they keep their status as one of 5 schools with over 50 years in Division 1 and zero appearances in the tournament. 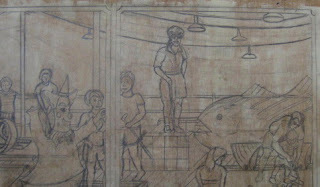 (I was also once in a show at one of the others, Northwestern). Another school that has shown my art (South Dakota) won their conference, but one without an automatic bid, so they stay home. Yet another school from my exhibition history (Illinois) was on the bubble and didn't make the cut. So that left me with four this year- Villanova, Northern Iowa, Texas, and Syracuse. Syracuse and Villanova are both high seeds, with a good chance of going far into the tournament. I'll keep you posted on their progress. Today would have been a good day to be in the Studio, except that one of the theater groups in the building had a matinee scheduled. This in itself wouldn't prevent me from working, but it's not uncommon for those in attendance to double park our little lot full, which could potentially leave me stuck up there hours longer than I'd want to be. I did make a brief stop in about 2 hours before showtime (all but a few of the lined spots already taken) to make sure that our space survived yesterday's brutal storm. It did. (I wasn't so much worried about damage from the fire that destroyed several buildings in town yesterday, up closer to the beach) I'm still in the drawing phase and that I can do at home. I left off last time in the lower right corner, with the issue of the two similar kids. In the end I decided to make changes to both of them. 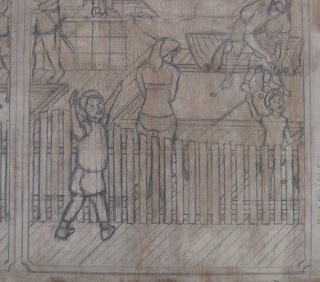 (see above) The earlier one (behind the fence) I just erased- he maybe made sense earlier in the process, but he later became mostly obscured by the fence when that went in. 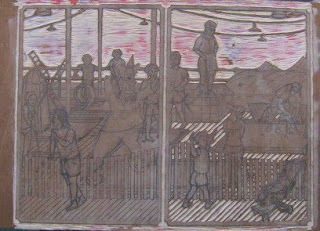 The more recent one (outside the fence) had been facing back at the viewer- I changed the head to face to the right. 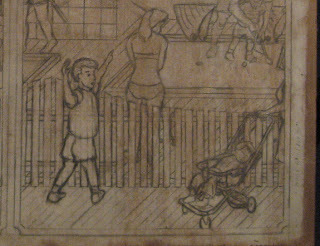 Then I added what he's facing, a stroller with a sleeping occupant, and just a sliver of the woman (his mother) pushing it. The idea is that he is, at the least, excited by the giant bluefish, and possibly trying to talk her into playing a round. I'm pretty sure that's the last major element to be added to this print. Over the next few days I'll look it over, probably make some minor adjustments, and be ready to start cutting it later in the week. 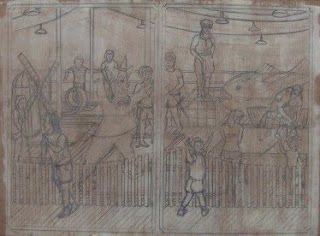 The current version of the whole block can be seen below. Went on some afternoon errands, including buying a new piece of plywood. 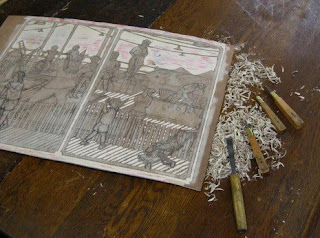 This was intended for my students, who will start their woodcut projects next week, but I may just keep it for myself and make their boards from another one I already had. Dropped it off at the Studio, and had about an hour to spare for drawing. 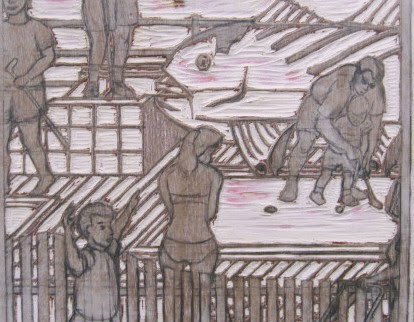 After considering a few different options, I decided to add the figure seen above- the kid on the near side of the fence pointing excitedly at the bluefish. Needs a bit of work, but I think he'll stay. The only problem is that this new figure looks way too much like the kid a few inches away on the far right, the one celebrating with his club. One of them will have to change when I go back to work on it over the weekend. I have until then to decide which one. Below is a view of the whole block as of today. 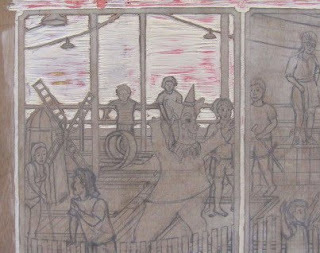 Been pretty busy over the past several days with a lot of school stuff, including grading research assignments and creating my first art history exam since the early 90's. With that done I went through the arduous process of setting up a new computer, which got at least far enough for me to create this blog post. So with a good chunk of my school work done, I could take a little time to work on the current block. Two significant changes- I put a figure on the near side of the fence in the lower left corner (top photo), and redrew the overhead wires (bottom photo). I hope that they're finally right, because I also added several of the big light fixtures that hang from them. I also made a few minor adjustments to items in the right panel. 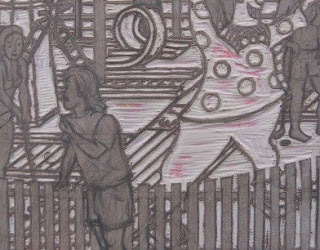 My plan includes adding one or two more figures in front of the fence (probably on the right side panel) but I think that will be the last significant addition. After that it's just a matter of fixing up lots more little things throughout. If all goes well, I'll be cutting by next week. 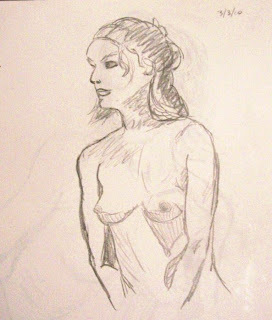 I've been a regular at the figure drawing group in Belmar going back to last summer, with some nights more successful than others, and something from each night getting posted here. Last time though, was just one of those times when nothing was working. One of those things that happens to artists once in a while. Naturally, I didn't put up any photos from that night. Didn't even bother to take any photos that night. You can't let things like this get you down. So another night, a new drawing pad, even a new hunk of charcoal, and I was back at it again. Still not exactly where I want to be, but at least tonight's results are not completely horrible. The top one is a 7 minute pencil sketch, and the other a 25 minute charcoal drawing that the model particularly liked, my last of the night. In any case, I've put lesser drawings up here in the past. It's only been 3 weeks since our last critique, but we wanted to get back to our usual schedule, and it didn't stop people from bringing work, whether new or old. 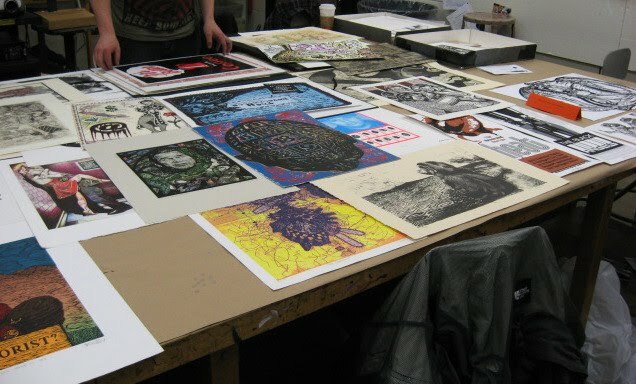 This time around we had 8 participants, all bringing art. Above are paintings from Edy and Jane, digitally altered photos from Vince, mixed media prints from Molly, and my current woodblock. 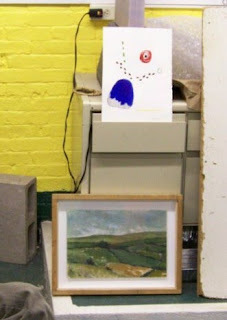 Below are an ink drawing from Tim and a painting from Guido. In addition to the activities there in the Studio, we took a brief field trip to the other corner of the basement. Adam had brought a variety of pieces, all part of an installation, and had set it up in an empty room. 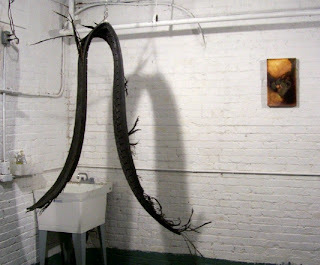 The centerpiece of the installation is that very large piece of truck tire tread (see below) hanging from a ceiling hook. We ended up having a long discussion about his elaborate multimedia plans for the project, so tonight's critique went longer than any we've had in a while. But since we always enjoy these nights, that just meant extra fun. If it wasn't for the early risers and the long distance travelers (three people drove 40 minutes or more to get here tonight) we might go longer all the time.